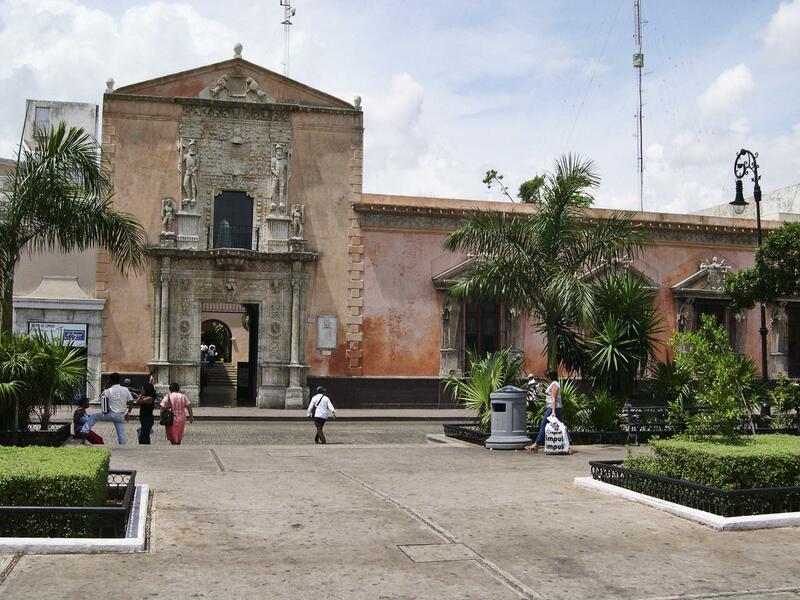 This house is named for Francisco de Montejo II, its patron and one of Mérida’s first Spanish residents. In its day, as today, it was an imposing structure with an elaborate main entry. Much of the relief sculpture framing this doorway was carved in a style known as Plateresque, which was fashionable in Spain in the late 15th and early 16th centuries. At the top of the elaborate doorway is the Montejo coat of arms. Its placement above the main doorway became a common practice among wealthy residents of Spanish America. Two sculptures flanking the coat of arms are unique. They are armed Spanish soldiers standing atop grotesque heads, which may represent conquered Maya. Aligned with the heads are bearded figures, smaller than the soldiers above them. They wield clubs and are covered in sheepskins. Some scholars have interpreted them as representations of the “wild men” found in Medieval and early Renaissance European texts. The central doorway opens onto an interior patio. This, too, was common in high-status in houses in Spanish America. 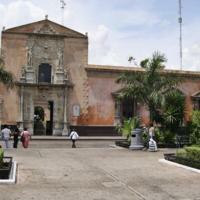 The open plaza in front of Casa de Montejo, once the city's main plaza, is today a public park. The patron of this house was Francisco de Montejo II, the son of a conquistador and a central figure in the settlement of Mérida. Through a royal grant of encomienda, Montejo had Maya laborers assigned to him. It was likely they who built this house, perhaps under the direction of a Spanish architect or builder. Since Mérida was founded upon the site of the Maya city of Tihó, Maya masons probably reused its stones in this building. Over the centuries, many Montejos lived in this house, passing the property down from generation to generation. Casa de Montejo was also remodeled numerous times—with parts of the compound falling into disuse as others flourished. And like many of the historic homes of Spanish America, this one eventually became commercial property, housing not a family but a bank. Casa de Montejo is one of the earliest, still extant houses built by Spanish settlers in New Spain. The style of the exterior links the house to architecture in Spain, the construction techniques and iconography—which combine Spanish ideas and desires with indigenous labor and visual traditions—set into motion a pattern that would become familiar in Spanish America, not only in architectural projects for private residents but also churches in urban centers and indigenous communities.